If you're traveling to Montreal over Christmas or New Year's Day, it's important to know what will be open and closed for the holiday season. The city pretty much shuts itself down on those two days, but there are exceptions to the rule. Surprisingly, some major attractions, restaurants, and museums remain open for holiday visitors. Learn more about when stores, banks, and other businesses are open, or when in doubt, call the commerce, business, or agency you wish to frequent directly for detailed scheduling information. Most city of Montreal offices will be closed from December 22, 2018 to January 2, 2019, including Accès-Montréal offices and borough offices. Some exceptions apply. Call 311 or (514) 872-0311 to confirm if your neighborhood borough office is closed throughout this entire period. 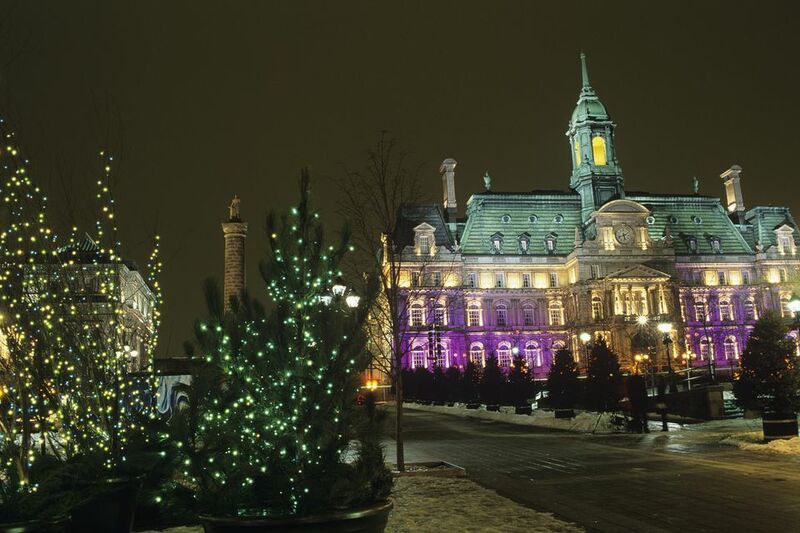 Residents and tourists will be able to inquire about municipal services throughout the holiday season, including on Christmas Day and New Year's Day, by calling 311 or (514) 872-0311. Federal offices, which include employment offices, are closed on Christmas Day (December 25), Boxing Day (December 26), and New Year's Day (January 1). Quebec's provincial office schedules vary by department. Quebec's general information line (1-877 644-4545) always closes December 24-26 and January 1-2. Quebec residents are advised to call the office or department they require services from for precise scheduling details. Montreal garbage and recycling pickups usually scheduled on Mondays are postponed until the next day in several neighborhoods. Thus, pickups scheduled December 25 are moved to December 26 and January 1 pickups are moved forward to January 2. However, other neighborhoods have either outright canceled pickups or rescheduled them on different dates, such as in Ahuntsic-Cartierville, Côte-des-Neiges–Notre-Dame-de-Grâce, LaSalle, Le Plateau-Mont-Royal, Le Sud-Ouest, L'Île-Bizard–Sainte-Geneviève, Mercier–Hochelaga-Maisonneuve, Outremont, Saint-Léonard, Ville-Marie, and Villeray–Saint-Michel–Parc-Extension. Find out what the holiday's garbage and recycling schedule is in your neighborhood. Montreal ecocentres (disposal, recycling, and trash centers) are closed December 24, 2018, through January 2, 2019. Postal service deliveries and mail collections are postponed, and Canada Post post offices are closed December 25-26 and January 1 every year, with the exception of independent postal offices operating in the private sector, which can remain open at their discretion. If December 25 or January 1 fall on a weekend day, then Canada Post usually shuts down the Friday or Monday closest to the holiday, which is not the case for 2018-2019 given that both holidays fall on a Tuesday. Montreal's public transit system is operational throughout the holiday season, with the vast majority of bus routes running on a regular schedule. However, December 25 and January 1 run on Sunday schedules, and metro train intervals are set at 10 minutes. Expect service slowdowns also on December 26 and January 2. As for commuter trains, the Agence métropolitaine de transport's commuter train lines adhere to a Sunday schedule on December 25-26 and January 1-2. Since no weekend service is offered on the Mont St. Hilaire, Mascouche, and Candiac lines in the first place, no train service will be offered for those same holiday dates. Call (514) 287-TRAM (8726) or visit the AMT website for train scheduling details (info line closed on December 25 and January 1). The Montreal Municipal Court at 303 rue Notre-Dame Est and points of service are closed from December 22 to December 26, 2018, and then again from December 29, 2018, to January 2, 2019, inclusively. Municipal Court point of service at 775 rue Gosford closes December 22, 2018, through January 2, 2019, inclusively. Call (514) 872-2964 for details. All Montreal parking meters follow their regular schedule throughout the holiday season. No exceptions. The restaurant situation in Montreal on Christmas day can be a drag. Foodies across the city concur choices are mostly limited to dining in Chinatown and hotels. Make sure to plan way in advance if you'd like to have dinner out at a Montreal restaurant on Christmas Day. Finding Montreal restaurants open New Year's Eve? Not a problem. Finding Montreal restaurants open New Year's day? That's another story. Nonetheless, there are some real restaurant gems open for business on New Year's day, including a few of Montreal's best known culinary landmarks. Montreal movie theaters are generally open Christmas Day and New Year's Day, including Dollar Cinema and downtown's Cinéma Banque Scotia and Cineplex Forum. The holiday season is one of the busiest thanks to blockbuster hits and family-friendly films being shown in movie theaters across the city. Montreal's quintessential corner stores, at least the 24-hour chains, generally remain open. But many don't. It's a bit of a crapshoot. Grocery stores/supermarkets larger than 375 square meters (4,037 feet) in size are legally obliged to close December 25 and January 1. However, smaller food markets can remain open at their discretion. But it doesn't mean they will. Always call your smaller local grocer to make sure they're open before heading out. Some may remain open, especially the chains. Call your local pharmacy if in doubt. All SAQ liquor stores are closed on Christmas and New Year's Day, with varying schedules throughout the holiday season. All SAQs open at 1 p.m. on December 26 and January 2. And don't sleep on those boozy purchases on December 24 nor December 31 as most SAQs close early at 5 p.m. with the exception of SAQ Express stores which close at 7 p.m., much earlier than their usual 10 p.m. close time. All of Montreal's public markets, including the Atwater Market, Marché Jean-Talon, and Marché Maisonneuve, close December 25-26 and January 1-2, with reduced hours on December 24 and December 31, from 7 a.m. to 5 p.m. Bonsecours Market closes December 25 and January 1. As a general rule, banks and financial institutions in Quebec close Christmas Day (December 25), Boxing Day (December 26), New Year's Day (January 1), and January 2. Usually, an extra day is taken off for every holiday day that falls on a weekend. Clients are nonetheless advised to contact their local branch in case of isolated exceptions. Montreal shopping malls are generally closed on December 25 and January 1. Usually, they reopen at 1 p.m. on Boxing Day as it's a popular day to shop, but to be safe, call your mall of choice to confirm. You can always count on the Montreal Casino being open on both Christmas and New Year's Day. Same goes for St. Joseph's Oratory, the Bonsecours Basin's outdoor skating rink, Atrium le 1000's indoor skating rink as well as Notre-Dame Basilica, and Notre-Dame-de-Bon-Secours. As for Bota Bota's floating Nordic spa in the Old Port, it's closed Christmas Day but open New Year's Day. Quebec ski resorts outside Montreal stay open for the holidays. Mont Tremblant, just 90 minutes northwest of Montreal, is one of the most popular options for skiing over the holidays. Montreal has got some of the most beautiful churches in North America and naturally open on Christmas Day given the religious significance of the holiday. Plan in advance where you'd like to go for Christmas Mass on Christmas Day and New Year's Day. The Montreal Biodome and Montreal Planetarium both close December 24 and December 25, 2018, but are open January 1, 2019, from 9 a.m. to 5 p.m. The Montreal Botanical Garden and Insectarium both close December 24-25 but open January 1 from 9 a.m. to 5 p.m. The Pointe-à-Callière Museum closes December 25 as well as January 1 but is open December 26, 2018, and January 2, 2019, from noon to 5 p.m. Last but not least and with perhaps the most kid appeal is the Montreal Science Centre, is closed on both Christmas Day and New Year's Day. Montreal museums not listed above generally close on both December 25 and January 1 but it never hurts to call your favorite museum in case of an isolated exception. As a general rule, Montreal parks close December 25 and January 1. "Closed" means that any ice skates, ski or snowshoe rentals are unavailable and that parks will not clear/clean up skating rinks and cross-country ski trails on those days. Basic services like bathroom access cannot be guaranteed either. Some exceptions exist: Bonsecours Basin's Old Port skating rink operates Christmas Day as well as New Year's Day. Residents are encouraged to call these facilities directly since their schedules vary though they tend to close the same dates as the Complexe Sportif Claude Robillard, which shuts down from December 24 to December 26 and then from December 31 through January 1 every year.